The worldwide first continuous linear stainer saves you precious time by processing up to 1,000 samples per hour. The COT 20 linear slide stainer is designed to meet the ambitious requirements of today's high throughput staining histology and cytology laboratories. The most versatile and high performance system in its market segment offers every staining capability you need. Up to 27 staining stations and capacious staining troughs of 250 ml volume each, enable a high durability of the solutions and an optimum arrangement of programmes. The automatic drain cycle, adjustable between 1 and 30 seconds, reduces the carry-over of the solvents. Agitation provides a better distribution of the solvents on the slides. However, it can be switched off to prevent sections of sensitive specimens detach from the slides. The COT 20 linear stainer is compatible to all common staining baskets in the market and therefore easy to integrate into existing lab environments. The staining time is adjustable from 20 seconds to 12 minutes and is the same for every bath. The flexibility of the tissue stainer COT 20 grants a large number of variations, the use of all common staining solutions and intermedia, and the application of all staining procedures used in histology and cytology routine. To protect user and environment, the stainer is equipped with a fume extraction system with two ventilators. For laboratories, where it is not possible to connect the stainer to a central exhaust facility, a charcoal filter unit can be installed to clean the fumes. - staining time: 20 sec. to 12 min. 2 storage containers for 10 baskets each integrated in the working plate. Optical and acoustical alarm indicating that a slide basket is ready. Fume extraction device for connection to an external exhaust facility. With its increased number of 27 staining stations the standard model offers the most flexible design of staining procedures and the highest throughput. The additional storage container for up to 4 slide holders equipped with 4 staining throughs allows 5 holders with 20 slides each to be started simultaneously. This model enables an efficient workflow at a reduced number of staining stations. 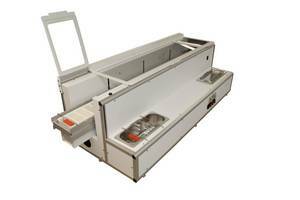 It provides 23 staining stations and requires less bench space than the standard model. Dimensions overall (W / D / H): 1300 x 570 x 440 mm. In addition to the extraction device supplied with all versions, this model with closed side panels has an integrated charcoal filter and an extra fan. It applies to labs where a connection to an external ventilation system is not possible. The solvent fumes are led via the refillable filter unit where the charcoal adsorbs the solvent residues.